While you’re hiking the trail or strolling the city, anytime is a good time to create a Google Street View 360-degree photo. You can shoot it right from the app on your iPhone — no special equipment needed. The app does most of the work of indicating when to shoot as you pick a scenic spot and start rotating your body to follow the orange circle on your screen. Start with your phone’s camera and follow the app prompts until you have all angles of your image filled in. As you shoot, the circle automatically repositions itself to help you complete your photo. When you're done, the app stitches the panels together. Then, publish to Google Maps to share your photo spheres. The app lets you manage public and private images, observe contributions from others, and view your captures in Cardboard mode with a VR viewer. You can also share your photo spheres on Facebook, Twitter, or privately via email. 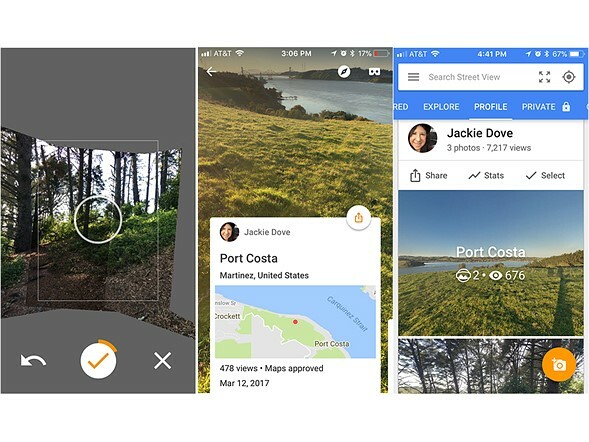 Those who rarely use their smartphone camera may still enjoy Google Street View's easy 360-degree photo creation and documentation features. Plus, it's a handy way to scope out nearby locations for photo opportunities.